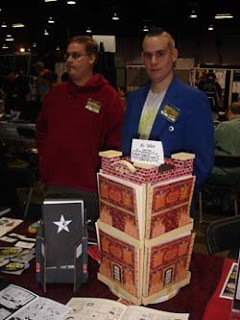 Worlds Worst Blaahhg: Chicago Comix Revolution! Spent a good part of my day today pounding the pavement getting my comics into comic shops. I traveled through the congested Saturday Chicago traffic and dropped of new books at Chicago comics and Quimbys. They're in opposite directions and I spend some time browsing so it took me over three hours. It's the kind of thing I need to do more often, to keep the stock of my books fresher, but it's kind of a hassle, especially during this horrible winter! I only have my comics in three shops in Chicago, but it's hard to think of three better shops for them to be in! Chicago Comics, and sister store Quimbys are well maintained, stocked and staffed, not to mention how great they are with local artists. Then, there's the Comix Revolution in two locations, Evanston, and soon to be a new location in Mt.Prospect. 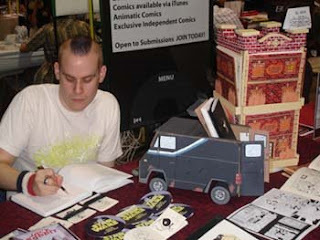 I worked at the Comix Revolution for three years and the ability to read the stock without paying for it, (sorry Jim) was not only exciting, but crucial in my development as a comics artist. Part of the swag I bought today in lieu for my minis, was the Awesome Anthology, put together by Charlito and Mr.Phil of Indie Spinner Rack fame. I actually just discovered ISR, as I've only, until recently, gotten the gumption to understand this whole podcast thing. I could hardly believe that a podcast actually existed for alternative type comics. Amazing! How could this have existed so long outside of my knowledge? AaRGH! Since discovering it, I've been tearing through the huge archive of impressive guests that they've doubtlessly exhausted with their infectious enthusiasm. It's actually been somewhat of a rejuvenator for me to listen to this stuff, and hear people talk about comics and the scene on a regular basis. I've gone to a bunch of conventions, but I rarely talk to people about comics, only having casual friendships with other comics artists. I haven't read it yet, but the Awesome Anthology is filled with a bunch of artists I dig, so I'm sure it's a, "can't go wrong!" Needless to say, if you haven't experienced Either Chicago Comics, Quimbys, Comix Revolution, or Indie Spinner Rack, DO SO! So I'm hard at work on Burning Building Comix #4, BUT, while I'm at work I sometimes have time to work on some sketches, and have been working on the character design for the people in Issue #5. 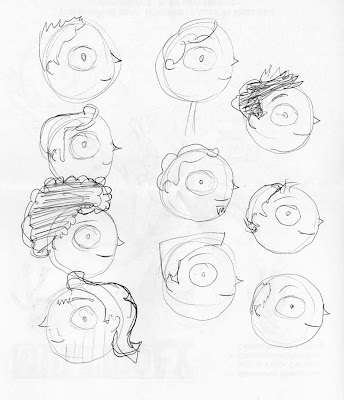 Here's a look at several head designs that didn't make the cut. And as proof to the above statement about attending cons, here are some pics from last years Wizard World Chicago (I know, I know). My blue coat, and Uber Comic Fan Jose! Drawing sketches while people ignore me! The displays and my bro Adam. 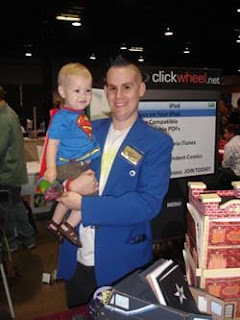 My boy and a convention pic. A TWO-FER! Van was trying to fit in with that whole cosplay crowd. And now for the ipod 3 song shuffle. Okay...this will probably sound like a lie, but It's raining men, is my wife's song, and I'm embarrassed for her. Although it is the punchline to a funny Simpsons line. I think I've had the Raveonettes before, and the Joaquin Phoenix song is from the Walk the Line movie. Both my brother Adam and my wife Emily like Joaquin's take on Johnny Cashs' songs better than the originals, and while I'll admit Joaquin has a nice voice, Johnny Cash didn't have a horrible harelip! You know, you talking about getting your work out to places in Chicago gave me an idea that I'm sorry has not occurred to me earlier. I've been coordinating this monthly reading series at an upscale tamale place near us called Tamale Hut Cafe, and the owner is a guy who prides himself on supporting Chicago artists. I only handle the literary programming, but he also dedicates his wall space to artwork from area artists, and while I know he tends to favor artists that are Latino, I also know he's showcased some white guys as well, including a guy who did some odd takes on superheroes. Would you consider coming out to the next event (which is Saturday evening April 19) and I can send you his way? Bring Em and Van as well...I'm the featured reader this month, so it'll give us a chance to hang out. Sorry to hijack your comments like this, but once I got going I knew I didn't want to start over in an e-mail.